1 The Loon family made their nest near the edge of Lake Lucerne. 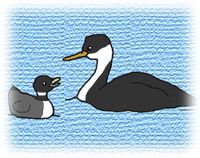 That spring, the two eggs hatched and the little loon chicks rode about on their mother's back for several days. When Mother Loon was certain her babies were ready for a swimming lesson, each one was gently nudged from her back into the cool waters of the lake. 2 The little chicks swam about by themselves in the water for the first time. It was hard for Mother Loon to keep track of them. When one little chick swam left, the other one swam right. One spring afternoon, the littlest chick swam around a large clump of bushes. Mother Loon did not notice he was gone. Before he knew it, the little loon was lost. 3 He swam around in the brown reeds until he spotted a beautiful Whooping Crane standing quite still at the water's edge. 4 "Have you seen my mother?" asked the little loon. 5 The crane had been standing motionless. "Go away," said the crane. "Can't you see I'm eating here? There's only room for one. Go away!" The little loon lowered his head and swam away. 6 A flock of mallard ducks startled the little loon as they landed on the lake to look for food. He swam behind some low tree limbs. The little loon peeked out at the ducks. Finally, he built up the courage to ask the ducks, "Have you seen my mother?" 7 "Wha-a-a-t? Wha-a-a-t?" quacked the ducks. "Wha-a-a-t do you want?" they quacked again. 8 "I say, have you seen my mother?" repeated the little loon loudly.